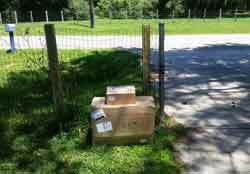 We receive boxes every day from UPS, Fed-Ex or the Post Office. Most boxes arrive in pretty good shape, but some - well, there could be some improvement. 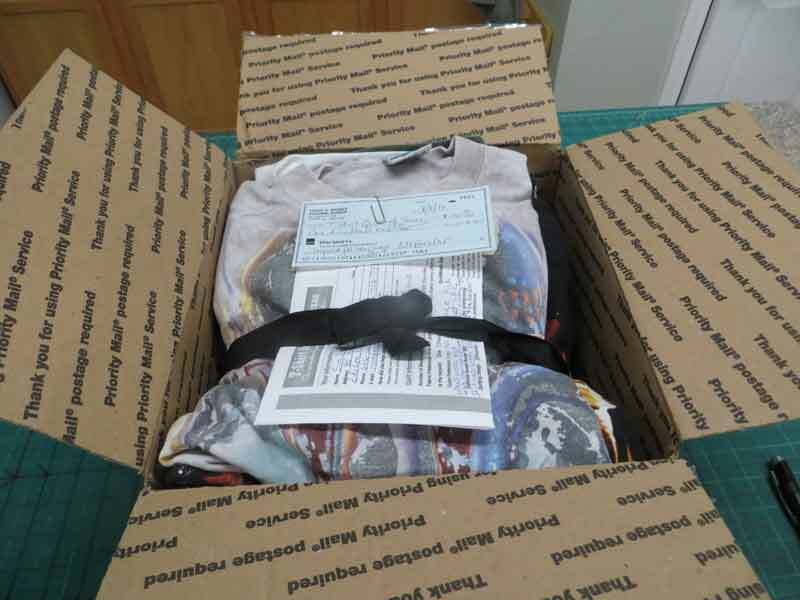 Here are some suggestions for shipping your valued t-shirts. The other day we received the 'perfectly packaged' bunch of shirts. We were so impressed that we thought there ought to be a prize of some sort. the box was sized appropriately for the number of tshirts. They wrapped it up with a RIBBON! Oh my!! OK, I have to admit my heart went pitter-patter when I opened this box. Everything was perfect. Most boxes that arrive, are just fine. However, there are some that need a little help. This box was under-packed (lots of empty space in the box), and, the shirts were not in a plastic bag. Before shipping your t-shirts, we suggest that you place the tshirts in a plastic bag, so that if your box does end up like this one, nothing falls out! Maybe a little more tape would be in order? Try to use a box that is not too big and not too small. Overstuffed boxes need lots of extra tape to keep the box from opening up when the shippers toss the boxes around. Under-packed boxes (see photo on left) tend to get crushed when buried under lots of other boxes during shipment. Don't worry, t-shirts aren't fragile, but they can fall out of boxes with openings. shredded newspaper, paper from your bill shredder. Messy, very messy, and may leave ink on your t-shirts. Include your order form, deposit check (if paying by check), and t-shirts in a plastic bag. If you are sending in shirts for more than one quilt, use TWO plastic bags, and just the basic info on the second order form. Amazingly, we get several boxes that don't have any identification or instructions. WHAT? We talk to a LOT of people every day. PLEASE put everything that we talked about on the order form (or copies of emails), especially if you are mailing the t-shirts a month or so after we talked! That way we get your order correct and there aren't any surprises, and everyone is happy. We HIGHLY suggest that you ship your boxes via Priority Mail from the Post Office. Yeah, the good 'ole USPS. Print your label online. Save Money. Get a tracking number. Yadda yadda. If you print your postage online - Save money - get a tracking number. My dog is friends with our Postal Carriers, no signature required. She delivers it to our covered porch, protected from the weather (and by my dog). If you go into the post office to calculate and mail your box, you WILL pay more for shipping. If you go to a "Shipping Place" to mail your box, you WILL pay more for shipping (plus handling fee). If you ship Parcel shipping you WILL pay more for shipping, (and not have a tracking number). So, how do I ship via Post Office and save money?????? If you don't have a postage scale, no problem. Go to your bathroom. Weigh yourself. Weigh yourself again with the package in your arms. Subtract the difference. That is the weight of your box. When inputting the amount of the box, ounces are not exact. So... you aren't sure if the box is 5 pounds - 4 ounces or 5 pounds -14 ounces. No worries. USPS charges the next higher pound to ship your box. They are going to charge you 6 pounds for the rate. Print the label on paper, tape it to your box and you are good to go. If you go to the post office, or other generic shipping facility they are going to charge the shipping PLUS a premium for the privilege to ship with them. I've seen boxes arrive where they paid over $45 or more to ship their box. I just cringe. We can ship your finshed quilt back to most locations in the USA for $25 (within Texas, $15). You can purchase boxes from Lowes or Wal-Mart, you can probably use most boxes that you already have to ship your tee shirts. "If it fits, it ships" to coin a phrase. You probably won't find a box from the post office that fits, so don't worry about it. NOTE: The post office does NOT like liquor boxes. Why? Who knows. Don't try to use them. 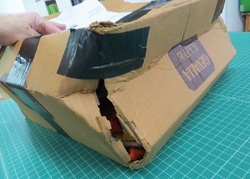 Boxes you have received from other online shopping from will probably work just fine. Keep in mind how much that box weighs. If you use a HEAVY box, you might be paying an extra pound or so to use that box. Save those bubble packs and bubble wrap to fill the empty spaces in larger boxes. While you might get a box or two from your local grocery store PLEASE don't go dumpster diving. You have no idea what kind of germs and little critters are lurking there that would be transferred to your shirts (and our shop). Of course you want tracking. These shirts are precious and you want to make sure they arrive safely. With USPS Priority Mail, tracking is included at no extra charge. Fed-Ex and UPS also offer tracking as part of the shipping cost. Please do not require a signature for delivery as this can delay delivery by a few days. Please email or call to let us know your tee shirts are on their way. We like to know when tee shirts are on their way, so we can get your order on our schedule.